Earth tone bead mix includes 4 animal designs: rhinos, elephants, lions and giraffes. Easy to string with large horizontal holes. Beads are 20mm with 2.5mm holes. Approximately 125 beads per 8-oz bag. My residents loved the animal beads and have made bracelates and necklaces they wear often.They want to make more. 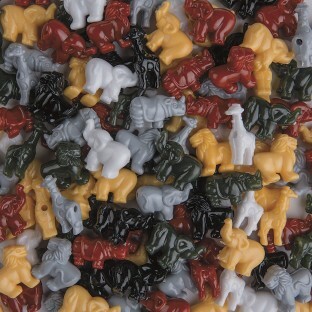 These were great for our safari theme in Sunday School good for little hands. Easy way to bead is wrap the Rattail cord with masking tape on one end tightly and then they string through well. Godd have a few more colors in there.